So if the average length of a word in the English language is five characters, and tweets can only be 140 characters, by that logic, one Instagram can convey the same emotion as roughly 35 tweets. Fuzzy math aside, it’s clear that visual content has the power to express a brand’s story in far different ways than previous social platforms ever were able to with text-only updates before. With more than 300 million Instagrammers sharing 70 million photos and videos, and 22% of U.S. users checking it once per day, it was the third-fastest growing platform in the US in 2014 and will get even bigger this year. As marketers, we’re often tasked with building elaborate content plans that span multiple social platforms, asked to measure content performance, and optimize for the future across (in many cases) hundreds of individual pieces of content each week. With more brands turning their focus on Instagram in 2015, the stakes have been raised for managers of these platforms. Now, it’s not just finding pretty photos to share, picking the perfect TBT, or even simply looking at likes and comments on your posts. Today’s top Instagram marketers are measuring and testing the elements inside of those posts to try and determine how to improve on strategy. So where do you even start? We’ve pulled together five ways you can start testing effectiveness of Instagram content. One of the questions we get asked most is simply, “When’s the best time to post on Instagram?” And while the easy answer is to say, “It depends on the content and brand,” that’s not solving any problems. Time of day testing is really a two-part process. Step one is establishing your baseline, and step two is experimenting and measuring. Below you can see how our team mapped out engagement on all of a brand’s Instagram content, showing the engagement on those posts over time. 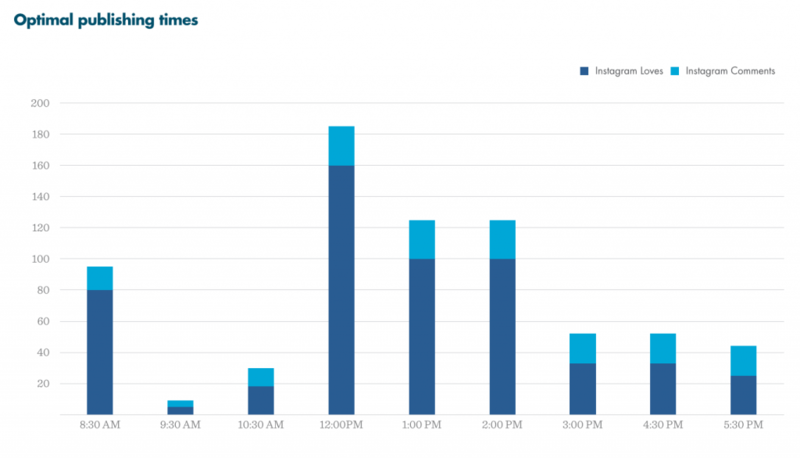 From this data, we see that around 8:30 a.m. our content engagement spikes then dies off until just after lunch time, 12:00–2:30. With this data, we can try and post content to Instagram at those times and remeasure the results after a few weeks (or months) of testing to see if it helped or hurt performance. When building your editorial calendar, you should be tagging your posts based on the theme it’s representing. While these might be simple and descriptive like “promotional” versus “culture-building,” the more granular you can get with your topic categories, the more buckets you can slice your social data into. 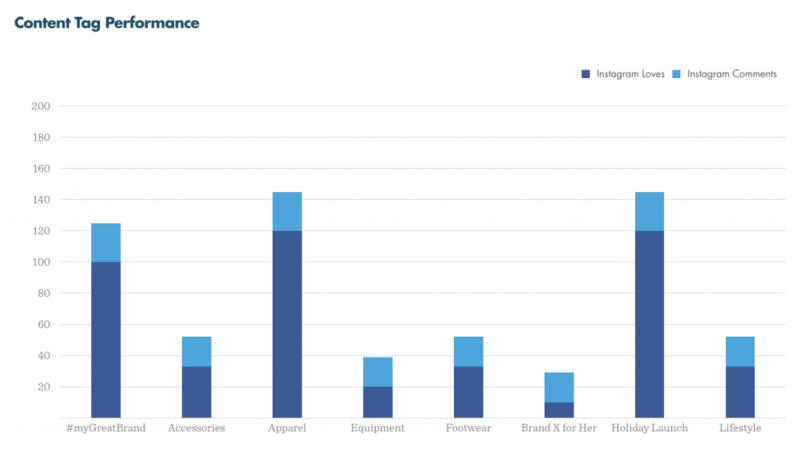 In this example below, see how the brand shown is driving the most engagement around three topics: their holiday campaign, their branded hashtag campaign, and posts of apparel. One of the easiest ways to expose your content to new audiences on Instagram is by using hashtags. Most brands are familiar with hashtags from Twitter, but on Instagram, there’s a whole world of hashtags for different groups and niches that smart brands tap into to connect with different communities. Hashtags can be used in your captions and comments. Each time you (or a commenter) adds a new hashtag (no matter the place), your photo is dumped into a new feed of similar content. #While #hashtagging #every #word might be too much, a caption like “It’s a beautiful day in the #NYC snow” might be just tasteful enough. It exposes your content to new users while also reinforcing a particular voice for your brand that lets users know you’re a brand who is comfortable using hashtags, and they can too. Test the number of hashtags you put in your captions, too (covered below), and experiment to find the sweet spot. Aside from the caption, you can use hashtags in comments to continue to tell your story. While these can be used as additional space to add keywords and hashtags, they can also be used when responding and engaging with people who comment on your Instagram content. Having the right number of hashtags means nothing if they’re not useful. If you’re posting about puppies, you’re not going to hashtag it #cat, but when you find out that there are 4.8 million photos #puppies on Instagram, that doesn’t seem like the best hashtag to use, either. Use sites like Iconosquare or Ritetagger to find complementary hashtags that aren’t so commonly found. Iconosquare is one of my favorites because I can just search for a hashtag, and it will return other popular results. For example, if I search #puppies, as you see below, I get at least 25 other hashtags related to puppies that might be better for me to use. Another option is to comb your competitors and complementary companies to see what types of conversations they’re tagging. Finally, use influencers! Huge niche communities exist on Instagram, and often you can build a rabid fanbase by participating in these types of communities that influencers expose. As for the question, “How many hashtags should I use on Instagram?”, the answer again varies. Nobody likes a hashtag hog, as I demonstrated before, but there definitely is some science to using them. Piqora’s study of 150,000 posts from brands on Instagram found that seven hashtags per photo post generates, by far, the most-liked engagement on Instagram—up to 23% more likes, in fact. Once you get past seven, you hit the point of diminishing returns, as people start to perceive them as spammy. 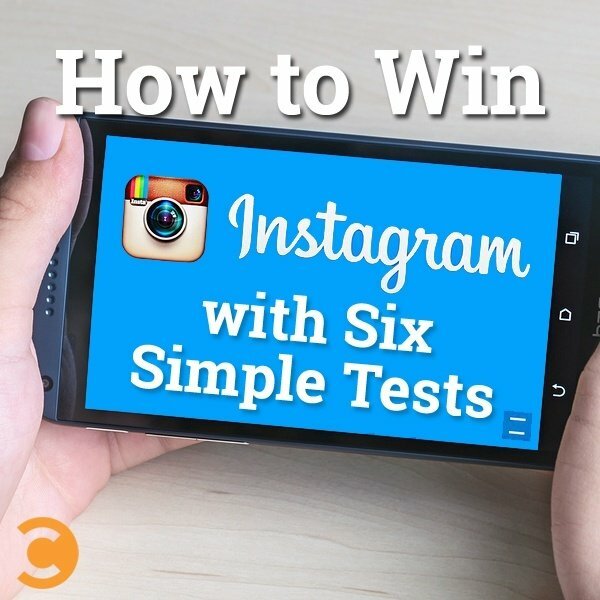 One of the easiest ways to test your Instagram copy is by taking cues from other platforms. Look at your top performing Facebook and Twitter posts. What are certain words or types of words that drive the most engagement on those channels? Integrate those into your Instagram copy. Do you even need a caption? Experiment using captions or just sharing photos without them. To get a bit more scientific, copy contains two key elements: a theme and a tactic. Themes are higher-level topical elements or brand pillars that you’re writing copy for. This could speak to your value prop, customer interest, or customer need. Tactics are the need that is conveyed at the core of your copy. These are tangible benefits that should resonate with a consumer. One simple way to test copy success is by building a score chart. Create a chart containing your different themes and approaches, along with the copy you’ve written and its success in social. Posts with the highest engagement should signal that copy style is the best. There are plenty of reasons for using logos or watermarks. They attempt to prevent theft without attribution, they carry your brand’s presence across platforms when Instagrams are shared, and they let everyone know this is branded content. Still, you’ll never really know what approach works best until you try. Since Instagram’s audience is typically an unbranded experience, you might want to ditch the logo in favor of high quality photos that look more natural on the platform. Some people find a lot of success adding additional graphics or quotes on their photos. Again, this is just another element to add when you’re testing how you build your posts. So try both. Create content that contains your brand logo or watermark and content that doesn’t. Like we mentioned before, create tags for branded and unbranded content, and look at engagement to determine if you should or shouldn’t be using logos on your creative. By holding your team responsible for goals with numbers you can actually measure, you’ll find your Instagram strategy becomes more focused and your decisions more informed. Social media is a series of trials, errors, measurement, and breakthroughs. Establish a baseline, and measure the change!